Global FPSO Market to Exceed USD 115 bln by 2024. Global FPSO Market is anticipated to witness growth of 19% and exceed USD 115 billion by 2024. Rising demand of hydrocarbons and increase drilling activities for exploration and production will drive the industry growth. Increase in the conversion of vessel to FPSO to augment the productivity and minimize the capital expenditure may complement the business growth, said a report from Global Market Insights. Converted FPSO market is witnessed to grow over 18%. Comparison with new built, converted FPSO requires low capital cost that drives the business growth. Reduced project execution timeline will increase the redeployed FPSO market share with a valuation over USD 700 million in 2015 followed by the expansion rate of over 22% by 2024. Increasing ultra-deep and subsea activities will rise the demand for New built FPSO. 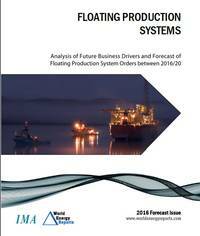 Rising exploration and production in deep water areas will provide substantial growth to the deep water FPSO market. Japanese companies are investing in FPSO market in Brazil for a depth of 765 meters. Moderate growth will be witnessed in the ultra-deep water segment subject to shift in E&P activities towards offshore field. The largest offshore field in Brazil named Libra pre-salt field accounts for the maximum FPSO vessels to carry crude oil production by 2017. Increasing exploration and production activities in the natural gas wells across the U.S. will boost the industry growth. High demand for hydrocarbons is fulfilled by increasing offshore activities coupled with discovery of unexploited reservoirs will propel the industry growth in the U.S. Shift towards renewables coupled with the focus on adoption of LNG as a cleaner fuel will drive the FPSO market in Europe. Growing demand for renewables will boost the industry growth in Norway. China FPSO market will witness a substantial growth with the valuation over USD 600 million in 2015. Increasing production and exploration activities in onshore and offshore field will propel the business growth in China. Shallow water depth FPSO market is witnessed to grow over 19% by 2024. The Agbami FPSO in Nigeria has the daily production capacity of 250,000 barrels. Oil majors across the globe including Eni, Chevron and Exxon Mobil have offshore project in Angola that accounts for a capacity of 1 million barrels per day. Angola FPSO market is estimated to grow over 23% subject to rising E&P activities in deep-water reserves. Key industry players include Hyundai Heavy Industries, MODEC, BW Offshore, SBM Offshore, Yinson Holdings Berhad, Samsung Heavy Industries, Bluewater Energy, Teekay and Aker Solution ASA.